Whether it is a scene depicting a backyard experience common to us all or an intimate view of a predator in search of prey, Ron's ability to make a connection between viewer and viewed is what attracts people to his work. "What interests me most in creating wildlife art is presenting a moment in time. An intimate moment in the life of a wild creature, brought to the viewer through the imagination, insight and skill of the artist. To be so close as to feel the breath and heartbeat, yet not to intrude. To be an observer, respecting the uniqueness, beauty and dignity of a wild creature, and to take away from the experience something basic, as if reconnecting with our own origins. A recognition that we are tied to nature right down to our very essence, and coming away from the experience renewed in spirit." Ron brings his experience to life using a detailed layering technique that has become his trademark. His acrylic paintings and limited edition prints allow his collectors to experience nature's wild creatures in a very personal way, bringing that moment into their homes to experience over and over again. 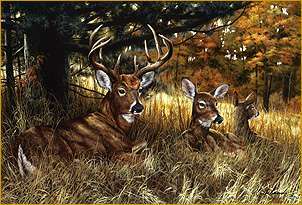 Ron is a member of the Society of Animal Artists and the Artists For Conservation. "A Shift in the Wind"